Zakumata (ざくまた),traditional offerings made as prayers for easy childbirth are an extremely LOCALIZED folk custom. In fact, they can only be found in certain parts Ibaraki Prefecture ( and along its borders in neighboring Tochigi and Chiba Prefectures, as well). I believe that an article of mine in Tsukublog was the first description and discussion of them in English, and you would be hard pressed to find anything written about them in Japanese for that matter. Most Japanese that you pointed them out to would have no idea what they were. I have only come to know what they signify and how they are made through countless discussions held over the years with various residents ( mostly elderly) of tsukuba`s old neighborhoods. What makes ZAKUMATA so interesting ( in my opinion) is how they are packed with multiple layers of symbolic meaning, which I guess for traditional way of looking at things meant multiple layers of power. And in the case of zakumata all SYMBOLIC SIGNIFICANCE is geared toward helping pregnant women who live in villages where they are offered have an EASY DELIVERY. Just what are these various levels of meaning? First, the Y- shapes of the branches are meant to represent a woman in labor with her legs spread open. Ideally the zakumata should then be set a Y-Shaped intersection in the road, reflecting or echoing this spread-legged shape. The wood used to make the zakumata is usually that of the chestnut tree. Why? Because the fruit of that tree fall off very easilly. You dont even have to pull on them, If you just give the chestnuts a little touch, they fall off- representing an easy delivery! And one more VERY IMPORTANT thing. The zakumata are offered to the spirits of DOGS which have passed on. The reason for this is that in traditional Japanese culture, dogs are symbols of easy delivery as it is believed that they bear their puppies safely and painlessly ( in fact pregnant women throughout Japan often go to temples to get special sashes called INU OBI ( dog sashes) which they wrap round their bellies to protect their unborn children– these are usually obtained on, you have probalby already guessed it- Days of the Dog, as part of the twelve day cycle of the Japanese zodiac!). 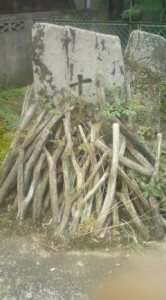 The Y-shaped sticks are inscribed with characters ( often by a local priest) which read INU KUYO (犬供養)- offerings to dogs, and this is in fact what the act of setting the zakumata is called. The concept is that if supplications are made to the spirits of dogs, they will possibly intervene during childbirth and help made delivery easy. Unfortunately, with all the development in the Tsukuba area over recent years, and the influx of New Residents from other parts of Japan, ZAKUMATA have been harder to spot in their most traditional form- set at Y-shaped junctions. This is not because of the contruction of wide new roads, but alos because many of the new residents compalin about the presence of these rustically whittled and inscribed sticks and ask them to be put out of sight. I guess they find them a bit creepy. 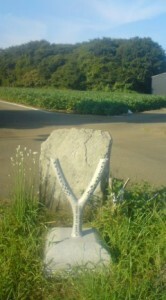 Well that is why I was happilly surprised the other day as I was strolling in the old villages behind the world famous High Energy Physics Laboratory in Tsukuba to chance upon a perfect zakumata scene, with Y-shaped road reflecting the Y-shaped offering itself. I just thought I`d share this rare sight with you.